Leuchtenberg Collection, Munich and Leningrad, by 1843; sold 1933 through (Heinemann Galerie, Munich) to (Count Alessandro Contini-Bonacossi, Florence and Rome); sold 1933 to the Samuel H. Kress Foundation, New York; gift 1939 to NGA. The painting was catalogued in 1843 and 1852 by J. D. Passavant as part of the Leuchtenberg collection. Heinemann Galerie no. 18964 (sold paintings card; copy in NGA curatorial files). Fern Rusk Shapley, Paintings from the Samuel H. Kress Collection: Italian Schools, XV - XVI Century, London, 1968: 68. Lorenzo Lotto: Rediscovered Master of the Renaissance, National Gallery of Art, Washington, D.C.; Accademia Carrara di Belle Arti, Bergamo; Galeries nationales du Grand Palais, Paris, 1997-1999, no. 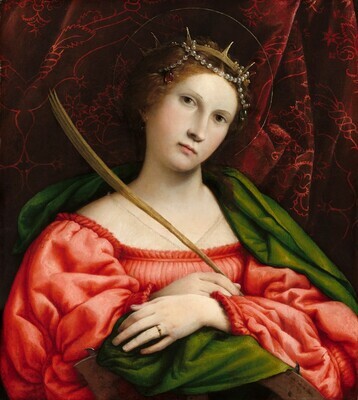 19, repro., as Saint Catherine of Alexandria. Preliminary Catalogue of Paintings and Sculpture. National Gallery of Art, Washington, 1941: 114, no. 228. Book of Illustrations. National Gallery of Art, Washington, 1942: 244, repro. 137. Paintings and Sculpture from the Samuel H. Kress Collection. National Gallery of Art, Washington, 1959: 159, repro. Summary Catalogue of European Paintings and Sculpture. National Gallery of Art, Washington, 1965: 78. Shapley, Fern Rusk. Paintings from the Samuel H. Kress Collection: Italian Schools, XV-XVI Century. London, 1968: 161, fig. 391. Shapley, Fern Rusk. Catalogue of the Italian Paintings. 2 vols. National Gallery of Art, Washington, 1979: I:275, II:pl. 189. Walker, John. National Gallery of Art, Washington. Rev. ed. New York, 1984: 191, no. 221, color repro. European Paintings: An Illustrated Catalogue. National Gallery of Art, Washington, 1985: 234, repro. Kopper, Philip. America's National Gallery of Art: A Gift to the Nation. New York, 1991: 157, color repro. Lorenzo Lotto: Rediscovered Master of the Renaissance. Exh. cat. National Gallery of Art, Washington; Accademia Carrara di Belle Arti, Bergamo; Galeries nationales du Grand Palais, Paris, 1997-1999: no. 19.